CEIA USA is proud to debut the new CEIA 02PN20-LFA, an Extremely High-Throughput Walk-Through Detector, for mass casualty screening of people with bags and luggage in mass-transit applications. Different from ferromagnetic detection devices, the 02PN20-LFA provides higher performances as it detects both ferrous and non-ferrous mass casualty weapons with near-zero nuisance alarm rate, by cellphones, tablet, laptop PC and other large metallic personal belongings. 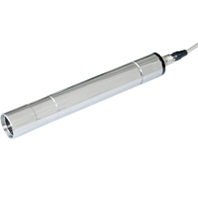 The 02PN20-LFA is compact and easy-to-install and is available in both panel and column antenna versions. It is also available as a walk-through gate or with separate pillars for integrated applications. CEIA USA representatives will be on site and available to discuss the new 02PN20-LFA at the upcoming GSX 2018 conference, booth #3129, September 25-27 in Las Vegas, NV. CEIA USA showcases the new CEIA SMD600 PLUS–MI2™ Multi-Sensor Walk-Through Metal Detector at GSX 2018. Provides simultaneous detection of all metal firearms and cellphone/smartphone devices. CEIA USA is proud to showcase the latest CEIA Multi-Sensor Walk-Through Gate, the SMD600 Plus-MI2 at GSX 2018 in Las Vegas, NV. The SMD600 Plus-MI2 is optimized for the screening of people in applications where simultaneous detection of all metal (magnetic and non-magnetic) firearms and cellphone/smartphone devices, including the most miniaturized, low metal content versions, is required along with high-throughput and a low nuisance alarm rate. On its own, the CEIA SMD600 Plus WTMD is already a complete and efficient solution for the high-sensitivity detection of any metal weapon and any cellphone/smartphone in applications, such as correctional facilities, where the inmates to be inspected are metal free or almost metal-free. The new SMD600 Plus–MI2 allows high-throughput inspection of visitors to correctional facilities or, in general, people in street clothes in a standard checkpoint divestiture situation where the detection of assembled/disassembled firearms along with cellphones/smartphones is required with a low nuisance alarm rate. The new SMD600 Plus–MI2 also provides a specific optical and acoustical signaling for either weapons or cellphones/smartphones, thus facilitating the secondary inspection by the security operators. 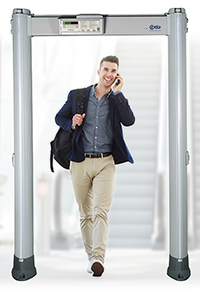 CEIA USA introduces MSD EVO™ for high transit pass-thru security screening. Improves ferrous metal detection uniformity inside transit area 100 times over conventional ferromagnetic poles pairs. Today, CEIA USA introduced the latest CEIA Ferrous Detector, MSD EVO™ with outstanding capabilities in security pass-through applications defined by pairs or more of magnetostatic poles. CEIA USA will be showing the MSD EVO at GSX 2018 security conference, booth #3129 in Las Vegas, NV. The MSD EVO targets assault ferrous assault weapons capable of mass destruction including large firearms and pipe bombs and provides fast throughput screening of individuals in street clothes attending public events such as concerts, theaters, galas, movie theaters, etc. Inside the transit area, the MSD EVO improves detection uniformity 100 times over conventional magnetostatic poles pairs, offers better discrimination against ferromagnetic personal items and greater immunity against external interference sources (i.e. moving metals or electrical interferences). CEIA USA debuts next generation MRI Safety Screening Systems. Provides simple, fast and effective analysis with no guesswork and true, intelligent alarms. CEIA USA, Ltd., a premier provider of safety and security screening systems, today announced the availability of the CEIA Healthcare Detection Systems – metal detection technology for MRI Safety Screening. The CEIA MetalMag walk-through detector and CEIA PD240CH hand-held detector combine the benefits of both cutting-edge metal detection and ferromagnetic detection functionality to automatically filter and suppress alarms for non-threat items, without compromising the required threat item detection capabilities. As a result, the new systems end false alarm fatigue and guesswork. No guesswork. True, Intelligent Alarms. MRI safety screening is essential for both patients and staff and should be simple, fast and highly effective every time. 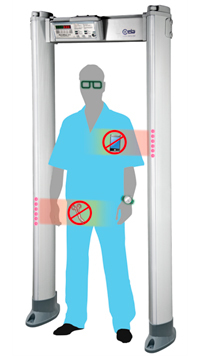 TheMetalMagwalk-through detector automatically detects a wide variety of metallic items and ferromagnetic material threat items, such as scissors, that are considered dangerous in MRI environments all while eliminating unnecessary false alarms for non-threat items such as shoes, eyeglasses and even underwire bras. TheMetalMagfeatures CEIA’s precision multi-zone targeting indication to pinpoint the exact location of the dangerous item on the person or in the body of the individual in transit. As a freestanding unit it does not require any specialized installation and can be quickly deployed prior to the MRI screening control point in any facility. 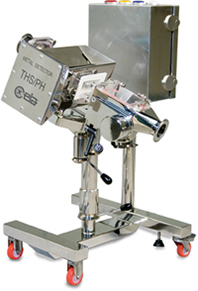 ThePD240CHhand-held detector provides precise screening and uniform detection of smaller dangerous items for patients prior to being admitted to the MRI magnet room. The PD240CH portable metal detector combines high sensitivity to ferromagnetic metal masses with immunity to non-ferromagnetic metal masses such as dental fillings, as well as dental and metal limb prosthesis. Additionally, by quickly changing the operational mode, it can become a complete metal detector capable of detecting any type of metal material to include pacemakers, prostheses and vital support devices, as well as any other object carried by the patient that should not be taken into the strong magnetic field area. This mode can also be used to identify, for example, the presence of metal slivers in a patient following an accident or swallowing metal objects. These solutions were developed in collaboration with Aegys -- an innovator of product and process solutions that enhance MRI safety and improve efficiency. "This partnership combines CEIA USA's unparalleled technology and quality standards with Aegys’ expertise and knowledge of the MRI industry,” said Steve Blackler, Co-Founder of AEGYS. “This collaboration ensures that these solutions are developed from a user perspective – meaning our customers will value deploying them." 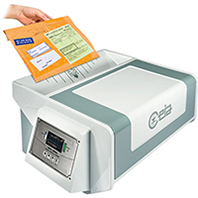 CEIA USA, Ltd., a premier provider of security screening equipment, today announced the availability of the new IED detector for letter and parcel inspection, the CEIA EMIS-MAIL. The EMIS-MAIL is designed to detect a wide variety of metal threat items including detonators, batteries, trigger circuits and other metal components of parcel bombs without false alarms for non-threat items such as metal staples, paper clips and metal binding spirals. CEIA is a world leading manufacturing company specialized in the design, engineering and production of Metal Detectors and Electromagnetic Inspection Devices. 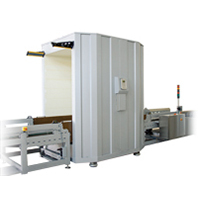 CEIA USA offers a broad range of metal detection and security screening solutions, including: Walk-Through, Hand-Held, Ground Search, and Industrial Metal Detectors, Bottled Liquid Scanners, and Non-Metallic Cargo Inspection Systems. CEIA USA provides nationwide sales, service and customer support to public (federal, state and local governments) and private sector customers in North America. Dynamic solutions and exceptional service are the foundation of CEIA USA’s commitment to customer satisfaction. ISO 9001 Certified, GSA Contract Holder and DHS SAFETY Act Certified. For more information, visit www.ceia-usa.com. Security planning for major events continues as a balancing act between meeting the challenges of evolving threats while providing minimal impact for a positive and fan-friendly experience. For professional sporting events, metal detectors are becoming an integral component of game-day security enhancements. A recent report from The National Center for Spectator Sports Safety and Security (NCS4) shows how CEIA metal detectors improve fan experience while maintaining consistent and reliable people screening (https://www.ncs4.com/sites/default/files/CEIA%20NCS4%20Lab%20Report.pdf). Critical success factors include moving patrons through the security checkpoint as quickly as possible while providing the highest and most accurate level of threat object detection. 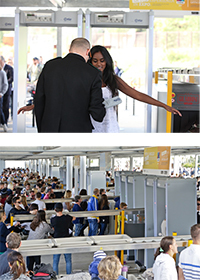 Consistent screening levels across all checkpoints is important for meeting security standards while the ease of using metal detectors serves to minimize security personnel training and product support. CEIA understands the challenges of screening a large number of people in a limited amount of time with maximum results. CEIA has been doing so for nearly 50 years. 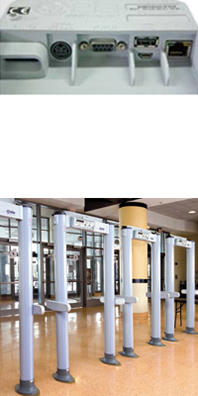 CEIA Event Security Systems combine superior performance with faster screening capabilities to move fans quickly and easily through the security checkpoint. These industry-leading walk-through and hand-held detectors are easy to use and provide outstanding reliability for stadium security personnel. To enhance security operations and positively impact the fan experience, turn to CEIA USA for simple, fast and highly effective screening solutions. 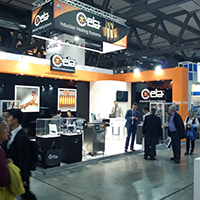 CEIA is a world leading manufacturing company specialized in the design, engineering and production of Metal Detectors and Electromagnetic Inspection Devices. 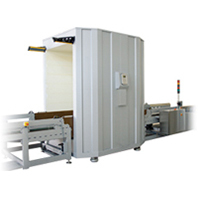 CEIA USA offers a broad range of metal detection and security screening solutions, including: Walk-Through, Hand-Held, Ground Search and Industrial Metal Detectors, Bottled Liquid Scanners, and Non-Metallic Cargo Inspection Systems. CEIA USA provides nationwide sales, service and customer support to public (federal, state and local governments) and private sector customers in North America. Dynamic solutions and exceptional service are the foundation of CEIA USA’s commitment to customer satisfaction. For more information, visit www.ceia-usa.com. CEIA USA, Ltd., a premier provider of security screening equipment, announces it has named Luca Cacioli to the newly-created position of Director of Operations. Mr. Cacioli will oversee all functions of CEIA USA and will be responsible for leading strategic initiatives to expand and grow the organization. “I am very excited to be associated with an organization that has an outstanding national, and international, reputation in the world of electromagnetic technology, induction heating systems and security screening solutions,” said Cacioli. 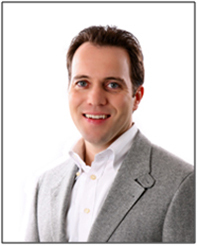 Mr. Cacioli comes to CEIA USA from Texas Instruments in Dallas, TX where he previously served in various world-wide product development and marketing management roles. As a marketing manager, he was instrumental in defining and releasing more than 75 devices, including the industry's first family of low-power audio codecs with integrated DSP, which were successfully adopted by several tier-1 consumer electronics customers because of their high performance/cost ratio and ease of use. Mr. Cacioli also published articles for industry publications, including the EE Times. Mr. Cacioli received his BSEE/MSEE from Universita’ di Firenze, Florence, Italy, and his MBA from Southern Methodist University (SMU), Dallas, Texas. He will be relocating to Northeast Ohio with his wife and two children. 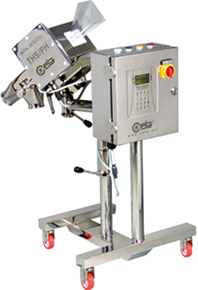 CEIA is a world leading manufacturing company specialized in the design, engineering and production of Metal Detectors and Electromagnetic Inspection Devices. CEIA USA offers a broad range of metal detection and security screening solutions, including: Walk-Through, Hand-Held, Ground Search and Industrial Metal Detectors, Bottled Liquid Scanners, Non-Metallic Cargo Inspection and Loss Prevention Systems. CEIA USA provides nationwide sales, service and customer support to public (federal, state and local governments) and private sector customers in North America. Dynamic solutions and exceptional service are the foundation of CEIA USA’s commitment to customer satisfaction. For more information about CEIA USA, visit www.ceia-usa.com. CEIA USA, Ltd., a premier provider of security screening equipment, announced today that it has won the 2012 U.S. Department of Homeland Security (DHS) Small Business Achievement Award. The award recognizes CEIA USA for its outstanding work in support of the DHS mission. In particular, CEIA USA is being recognized for work performed for Transportation Security Administration, Procurement Division in FY11. The award recognizes CEIA for the development and deployment of its EMA series bottle and liquid scanner that enables the quick and accurate inspection of sealed and unsealed bottles for various security authorities. 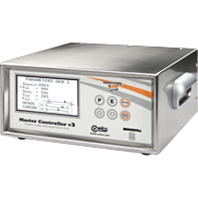 The scanner is compact in size and provides an automatic analysis of sealed containers in seconds. CEIA was awarded a nationwide contract to provide the EMA scanner in airports and facilities across the U.S.
CEIA USA, Ltd. announced today the EMIS Series of Cargo Screening Systems have been placed on the Transportation Security Administration’s (TSA) Air Cargo Qualified Technologies List (QTL). Designed around client requirements, the newly released APSIM/3 network module is now available as an upgrade to any CEIA Walk-Through Metal Detector for the added capability of being managed over a network. The APSIM/3 module can remotely track and download recent transit results even without the use of a centralized networking software package. With the module’s included web interface, the user just logs into the network to obtain basic graphs and transit reports as well as control the basic parameters for any detector connected. The module also offers the capability to update the metal detector’s firmware and track important configuration information for initial and subsequent setups. The APSIM/3 module is primarily used to connect with CEIA’s NetID Software. NetID is the market leader for robust metal detector connectivity with secure, failure resistant communications. It has been the backbone for many large federal, commercial and local installations for years. An arena used by an NBA basketball team and for various musical and family performances utilized NetID to be able to quickly adjust their large fleet of metal for the type of event taking place. Instead of walking from machine to machine, they can quickly and automatically convert every detector in the arena to detect different threat objects from the NetID workstation. This saves not just labor hours, but also improves response time and eliminates the chance of different settings on different equipment. The simple addition of the APSIM/3 network module increases efficiency since monitoring can now be centralized and multiple trips to various detector locations can be eliminated. Even with its enhanced interface and other new features, the module is available at a greatly reduced price because of recent technological advances. Contact your CEIA representative for more information. CEIA USA, the world leader in threat detection technologies, announced today the availability of a solution that will drastically improve the screening of non-metallic commercial cargo such as produce, seafood, meats, printed materials, flowers and apparel. The EMIS (Electro-Magnetic Inspection Scanner) quickly and accurately screens packages or pallets using a harmless, low intensity electromagnetic field to ensure there are no explosive devices hidden within. This method of inspection does not require visual interpretation of an image, unlike typical x-ray scanners. Threats can be identified throughout the entire stack of cargo minimizing operator interaction with the goods. In 2007, Congress passed the Implementing Recommendations of the 9/11 Commission Act more commonly known as the 9/11 Act. This new law mandated that all cargo transported on a passenger aircraft be screened for explosives by August 1, 2010. TSA developed the Certified Cargo Screening Program (CCSP) as a solution to help industry reach the 100 percent screening mandate. The program enables freight forwarders and shippers to pre-screen cargo, avoiding any potential bottlenecks at the airport. Facilities such as manufacturers, warehouses, distribution centers, third party logistics providers, indirect air carriers, airport cargo handlers, and independent cargo screening facilities may apply for the CCSP. CEIA USA, which has provided metal detection solutions to a variety of industries for many years, presents the CEIA SMD601 Multi-Zone Plus metal detector complying with ALL the required sections of the NIJ Standard 0601.02 (U.S. Dep. Of Justice). CEIA USA, which has provided metal detection solutions to a variety of industries for many years, presents the CEIA SMD601 Multi-Zone Plus metal complying with ALL the required sections of the NIJ Standard 0601.02 (U.S. Dep. Of Justice) that establishes requirements of sensitivity, discrimination and immunity for law enforcement and correctional facilities. Because the CEIA SMD601 Multi-Zone Plus Metal Detector was specifically designed with this standard in mind it is excellent for detecting conventional weapons, such as guns and knives, but it is also extremely good at detecting small, hard-to-find items that could be considered a threat to officer and prisoner safety such as razor blades, handcuff keys, or screwdriver bits. It also has exceptional immunity to environmental interference which allows it to be easily installed and operated in any location. Analysis of the person passing through is quick and accurate. 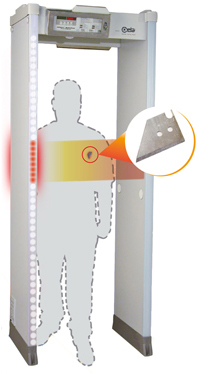 The three levels of security specified by the standard (Large, Medium and Small object size) are pre-loaded in the metal detector and can be selected directly by the user via a simple operation at the control unit that has anti-vandalism construction to prevent abuse and unwanted programming. A full-height light bar displays the vertical location of the detected metal masses in transit. This results in rapid identification of threats and a reduction or elimination of manual searches. The technology used in the SMD601 Multi-Zone Plus is completely harmless, yet can detect items concealed inside the body, thus eliminate the need for costly, ineffective body orifice screening devices.